Only the mainly C14 west front, largely renewed, can be seen, but the nave and much of the chancel probably go back to the C11. After redundancy, it was converted into a bookshop. St Olave, the oldest surviving church-building in the city centre, had the smallest parish (Dallaway I p187). The dedication suggests a Scandinavian link and moreover that it was not founded before the mid-C11 for St Olaf, King of Norway was converted to Christianity and then killed in 1030. The founders were probably Scandinavian merchants; one Ketel Esterman, a Nordic name, is known to have owned some houses nearby (Millward and Robinson p79). The parish of St Martin was united with St Olave in 1899. The flint west front is wedged between other buildings, and the detail, C14 in style but largely dating from the C19, gives little idea of the age of the fabric. However, a narrow round-headed south doorway is visible inside. Much of it is plastered, but the original voussoirs can be made out under modern paint. From the dimensions which are best seen on an engraving of c1851 (1 p220), this was post-Conquest C11 and is thus likely to provide the date of the nave. The chancel is deflected to the north and though altered, probably retains its original dimensions of the same date. In 1851, a round-headed niche of Roman brick was found in the east wall (1 p218) which, though not preserved, was probably also C11. C14 alterations included trefoil-headed side lancets in the chancel, and the former east window (VCH 3 p162). Others were the weathered angel corbels at each base of the west gable and the small, shingled bell-turret and broach spirelet, with supporting buttresses. After the Reformation, the west doorway and window were replaced by ‘debased features’ (1 p225). This term is usually to be interpreted as mid-C16 and though the Sharpe collection drawing (1804) shows little subsequent alteration to the doorway, the window then consisted of three uncusped lights under a segmental head, which would be consistent with this date. The window at least was completely replaced in 1851-52 as part of a restoration by an unknown architect and the doorway was at least substantially restored. The present ones are C14 in style (a sensible choice in view of the other detail of this date that was present) and the chancel arch and the roofs were replaced. At the same time the nave was heightened by 5 feet, the east wall was rebuilt (ibid) and an undercroft, probably a burial vault, was found. The completion of the restoration followed in 1855, when T Nicholls carved the gargoyles on the west front (Hampshire Telegraph and Sussex Chronicle, 8 September 1855, quoted in www.victorianweb.org). 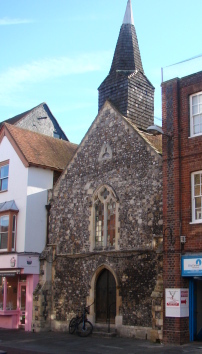 In 1956 after closure, most fittings were removed when it was adapted by H Sherwood (CCC file) as a Christian bookshop, which still remains, though it was closed for a period (the font is now at Elsted). Sherwood also replaced the east window, which had already been renewed in the C19, by the present three lancets. Aumbry: (By blocked north doorway) Quite an elaborate C14 example with a cusped ogee-head, shafts, foliage capitals and head-stops. Monuments: Various, some from St Martin’s. Painting: (No longer extant) J L André notes that there had been a Coronation of the Virgin on the east wall (SAC 43 (1900) pp228-29) said to have been ‘rich and elegant’. No trace of this remained even when he was writing, though he considered it C13. Piscina: (South wall of nave) C14 ogee-headed. It is a handsome piece, which has probably been moved, since it is too high off the ground to be easily usable.